Like most Paleo eaters, I typically stick to meat & veggies for dinner. To keep it from getting boring, I like to try different types and cuts of meat, and pair with seasonal veggies. Sometimes cooking meat can be scary- at least for me. I get a little nervous (especially with thicker cuts) that I'm going to undercook it. However, I also don't want to overcook the meat & dry it out. Through trial & error, I have come up with some magic equations that equal perfectly cooked cuts of meat. With this recipe, you can have a thick, juicy cut of meat~ worry-free. Pork has gotten a bad reputation over the years, that it doesn't deserve. 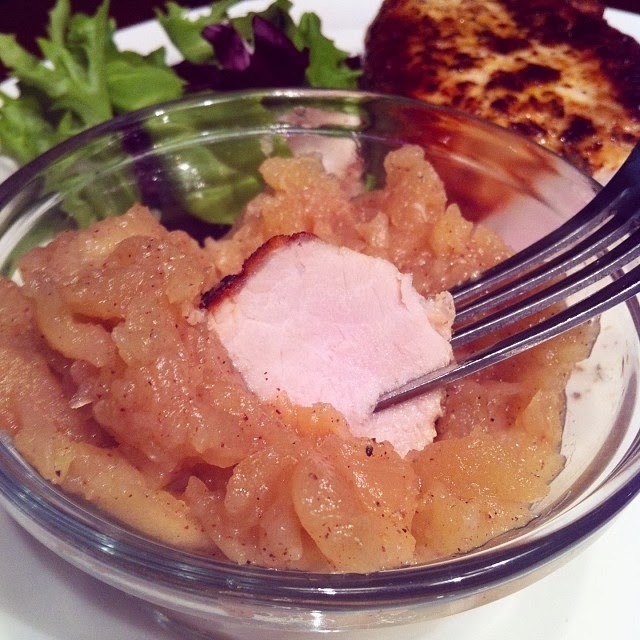 The pork chop is actually really lean- typically even more so than a chicken breast. 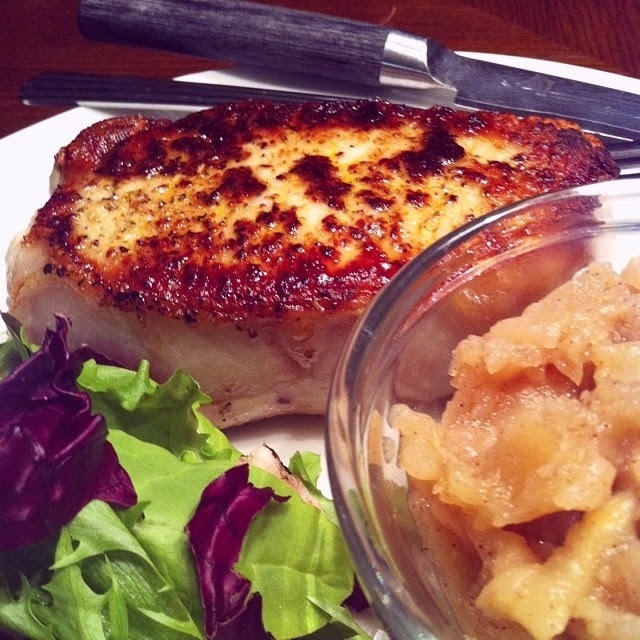 I find that pork chops have a light, subtle flavor, and are a nice alternative to switch up your meat options. The neutral taste of the meat lends itself to many flavor combinations, but this is my favorite basic recipe. I love sautéing my pork chops in a pan before putting them in the oven. It allows the almond meal and spices to create a delicious crust on the outside that really seals in all of the juices. They are so easy to prepare, and are great served with cinnamon apples (click here for my easy recipe) and a green salad or crispy green beans. *Feel free to multiply the recipe. In a large pan, heat the coconut oil over medium to medium-high heat until melted. 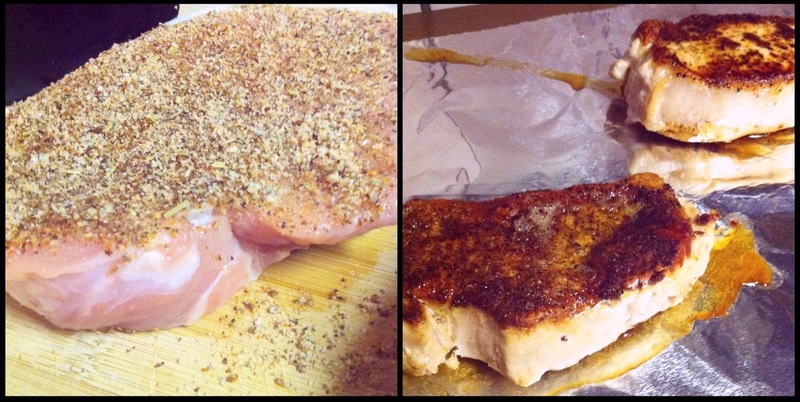 Add the pork chops & cook for 3 minutes (don't touch the meat once you've set it down~ let it brown & form a nice crust). Flip the pork chops, and cook for an additional 2 minutes. Place the pork chops on a baking sheet lined with foil, and transfer to the oven for an additional 8 minutes. This sounds like the perfect way to cook the pork chops I bought this week-- can't wait to try it tonight! I hope you like 'em! You should try out the green beans or applesauce too :) Let me know how it goes! It only takes that long to cook? This recipe is perfect. I love it. 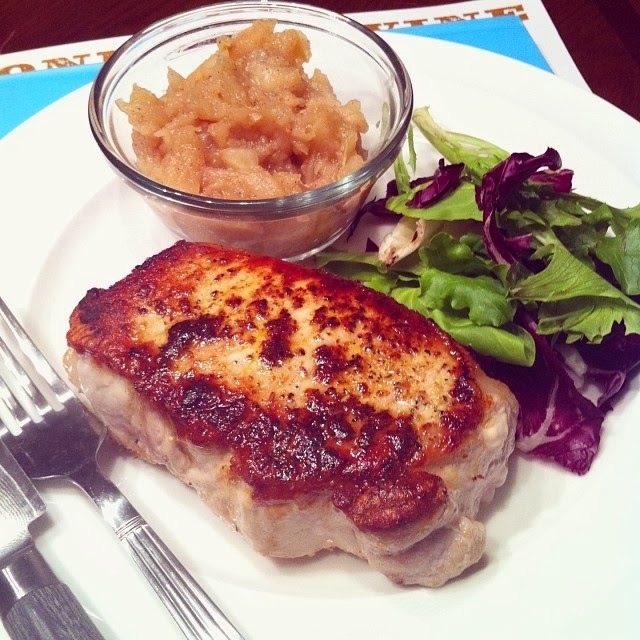 It has become our families go-to pork chop recipe. Thank you for posting. This was truly a perfect porkchop! Thank you so much for sharing this recipe! The flavor was amazing and they weren't overly dry. Thank you for such detailed instructions, especially regarding the timing in each step. 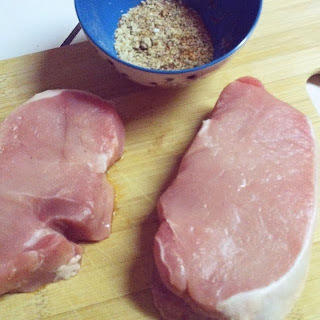 I came across this recipe when I googled paleo pork chops yesterday, and it was delicious! My fiancé loved it so much, and it was a great way to have a paleo meal that he didn't realize was paleo, haha. I loved that it was also quite easy to make, especially considering how tasty it turned out to be. This will be on my menu this week...can't wait to try it! I've made these a few times now and love them! I made it a little easier by using an oven proof pan to saute them then straight into the oven. One pan to clean! So glad you enjoy them! Your comment inspired me to buy a new oven-safe pan... & you're right. So much easier :) Thank you!